A while back, I had the idea to launch a cookbook called The Freelancers Cookbook. Unfortunately, while there was lots of interest in it at the time, it didn’t come to fruition. However, I did the legwork and gathered a lot of recipes from freelancers before the project eventually lost steam. For this column, I’m reviving that idea as a part of Creator Resource’s self-care initiative. We really believe that part of being a freelancer is taking the time to take care of yourself so that you can do the best work possible. One of the biggest aspects of being healthy is a balanced meal, which sometimes feels hard to do when you’re on a deadline, you’re broke, and just generally frazzled. The Freelancers Cookbook column is going to be an ongoing series that highlights recipes from other freelancers that are easy to make, and easy on the budget. If you’re subscribed to our site or social media feeds, great! You’ll see the recipe posts as they come up. If not, you can bookmark the Freelancers Cookbook tag to see when new posts go live. If you have a recipe that you think would be a great fit for The Freelancers Cookbook, feel free to send in your idea (with Freelancers Cookbook Recipe as the subject) to info@creatorresource.com. And one more quick note: our amazingly fantastic banner image was done by A.I.Miller. 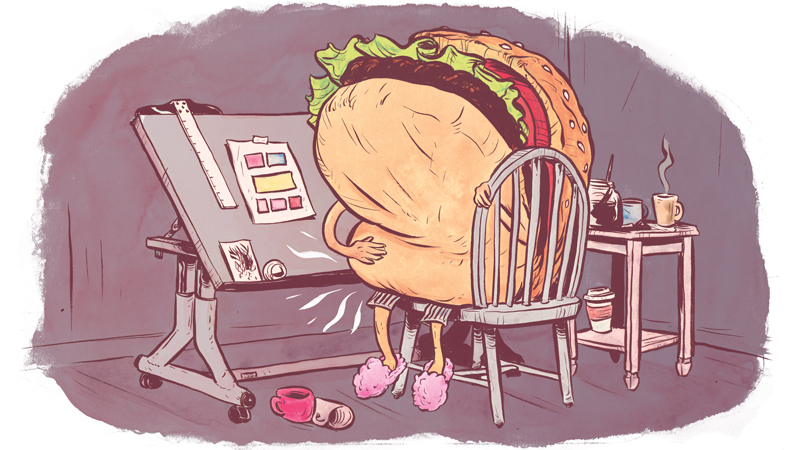 You’ll see this fabulous little starving burger artist with all our Freelancer’s Cookbook recipes that go up!